This special villa was built in the seventies around an old water mill from 1700. There are a total of 15 apartments. All apartments are very simple and basic with wrought iron furniture. You have a wonderful view of the sea. 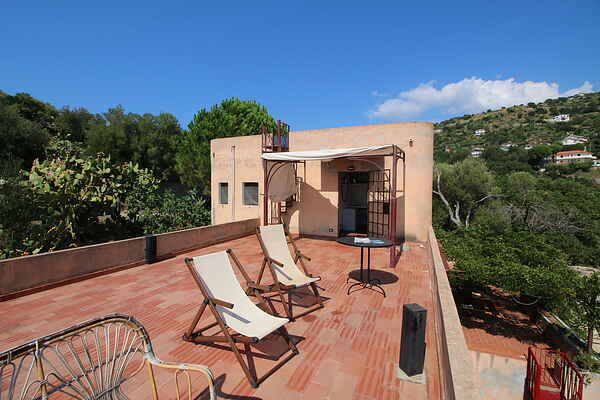 The villa consists of flat roofs with arches and terraces, stairs and hidden passages. It is a special building. There is also a garden with a saltwater swimming pool. The villa is located directly on a beach with stones. You have to go down several steps to get to the pool and the sea. Guests have at their disposal a TV room, billiards, table tennis, barbecue and canoes. The sea is only a few meters away with picturesque bays and is surrounded by a lush nature. There is a natural inlet in the rocks next to the villa with a natural swimming pool. You can also reach this natural swimming pool by a bridge from the large terrace of the villa. A sandy beach is 100 meters away. Many other sandy beaches are accessible by car. It is a 5-minute drive from the white sandy beaches of Capo Vaticano and a 20-minute drive from Tropea. To get to the beaches of Capo Vaticano, you can leave from the villa with a boat. Supermarkets and restaurants can be reached by car.